Is an iPad a computer? Is a Microsoft Surface a tablet? What about Chromebooks – how do they fit into user’s uses? The major tech marketers are working to shift perceptions, such as Apple’s positioning of the iPad as a computer. Even though perceptions do shift buying decisions, user innovation and inertia are a force to reckon with. Many users have already pioneered ways to use their devices. We went straight to the users to see if they’re using tablets and notebooks the same, using iPads differently from Android Tablets, and Windows Notebooks from Chromebooks. Our basic hypothesis is that perceived differences, if substantial, can be confirmed by measuring user behavior. iPads are more useful – based on users doing more with them. 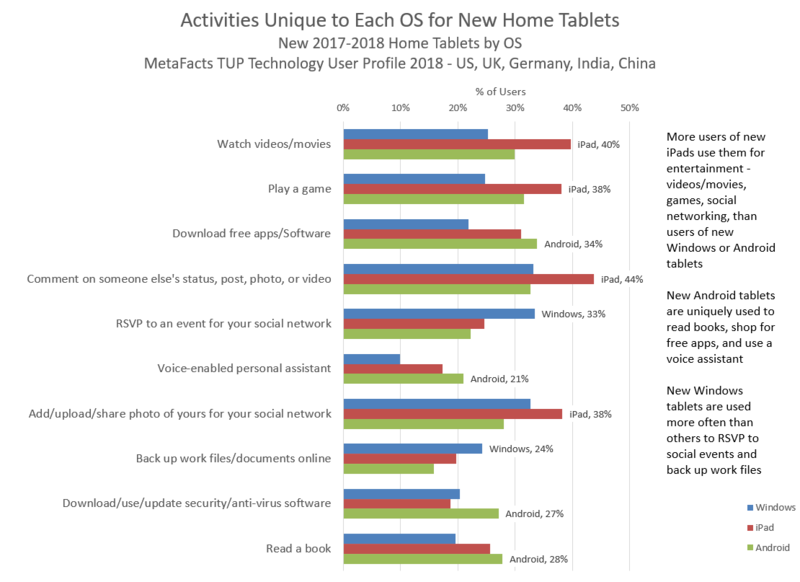 A higher share of users of recently-acquired home-owned tablets use Apple iPads for more of the major tablet activities than users of new Windows tablets or new home Android tablets. This is based on results from the MetaFacts TUP 2018 survey, conducted among 14,273 respondents across the US, UK, Germany, India, and China. In this survey, we asked respondents about 73 different activities regularly used on the connected devices they actively use, including desktops, notebooks, tablets, smartphones, basic cell phones, or game consoles. The activities span a wide range of activities, from communication and entertainment to shopping and productivity. Drilling down to those with new home tablets or notebooks, we found some interesting commonalities as well as striking differences. 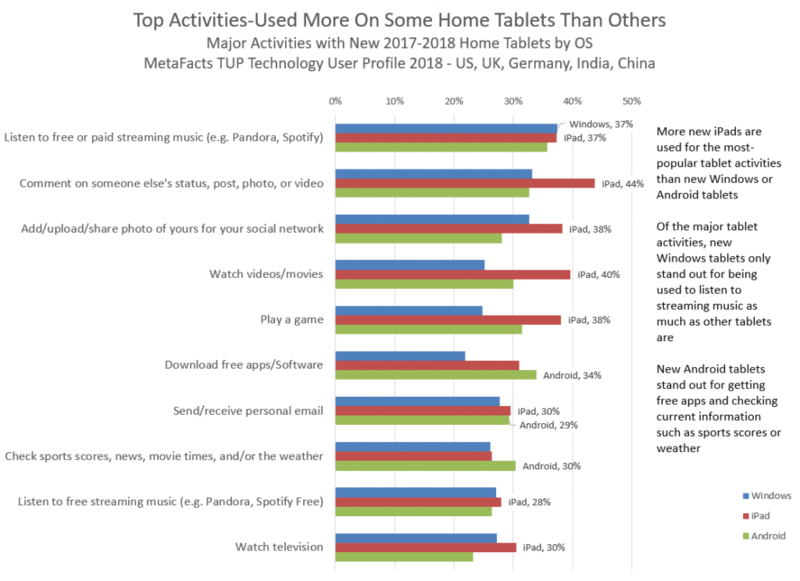 Of the top activities used by the largest share of new home tablet users, a higher share of iPads users regularly conduct the majority. Where social network commenting and movie/video watching rank highest among iPad users, these users are somewhat surpassed by Android Tablet users in checking updates on sports and weather, and in downloading free apps/software. 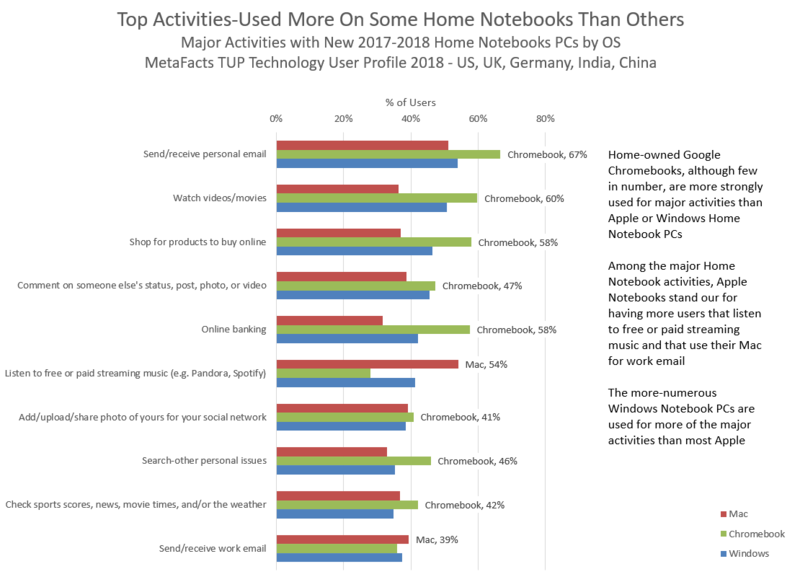 User of the newest Windows tablets aren’t strongest in any of the top activities, although they are nearest to the others in listening to music and checking personal email. iPads, and tablets in general, are used for more passive or limited involvement activities than notebooks. These top tablet activities include listening to music, playing games, watching television, or commenting on social networks. Home notebooks, in contrast, are most widely-used for both personal and work email, online banking, and online shopping. We also looked at what makes each operating system unique, both on tablets or notebooks, with respect to how users use their mobile devices. We measured uniqueness as the range between the highest and lowest percentage of users of each type of device. This revealed several differences in tablet use. New home iPads are being used more often for fun and connection than users of new home Windows or Android tablets. Android tablets stand out for being used to read books, shop for free apps, and to use a voice assistant. [TUP subscribers can dive into the data deeper to see the relationship between OS and choice of voice assistant). New home notebooks are also being used differently between operating systems. Apple’s notebooks are used differently than the average home Windows notebook or Chromebook – with remote PC connections, listening to streaming music, or downloading music. New Google Chromebooks are used more than average for online banking, to watch videos/movies, to comment on blogs, and to recommend or share information about products and services. Among these top unique activities, one is unique for new home Windows notebooks: creating personal graphics/presentations. Inertia is great for entrenched leaders and a serious barrier for new entrants. People change habits more slowly than they change devices. By focusing on the main activities users enjoy and value, To expand the market will be helped by making it easy and smooth for users to easily do their activities regardless of device type. In Apple’s case, popular activities such as watching videos or movies requires apps or browsers that seamlessly span iOS and MacOS devices. While users define what they have by how they use it, there will continue to be confusion among some press and analysts seeking to distinguish devices. However, it’s unlikely that a new form factor category will emerge from the push to redefine and reposition platforms. Instead, users will continue to vote with their feet (or in this case, their fingers) and look for the device/OS combinations that will best help them do whatever they want or need to do. The analysis in this TUPdate is based on results drawn from the most-recent wave of TUP (Technology User Profile), the 2018 edition which is TUP’s 36th continuous wave. This survey-based study details the use of technology products by a carefully-selected and weighted set of respondents drawn to represent online adults. This specific wave spanned the US, UK, Germany, India, and China. From the installed base we focused in on online adults who were using either a new home tablet or notebook PC. We chose those mobile devices which had been acquired in the most recent 1.5 years, specifically during 2017 and the first half of 2018. This TUPdate includes a complimentary brief summary of recent MetaFacts TUP (Technology User Profile) research results. These results are based on results of the MetaFacts Technology User Profile 2018 survey, its 36th consecutive wave. For more information about MetaFacts and subscribing to TUP, please contact MetaFacts. Current TUP subscribers may request the supporting TUP information used for this analysis or for even deeper analysis.